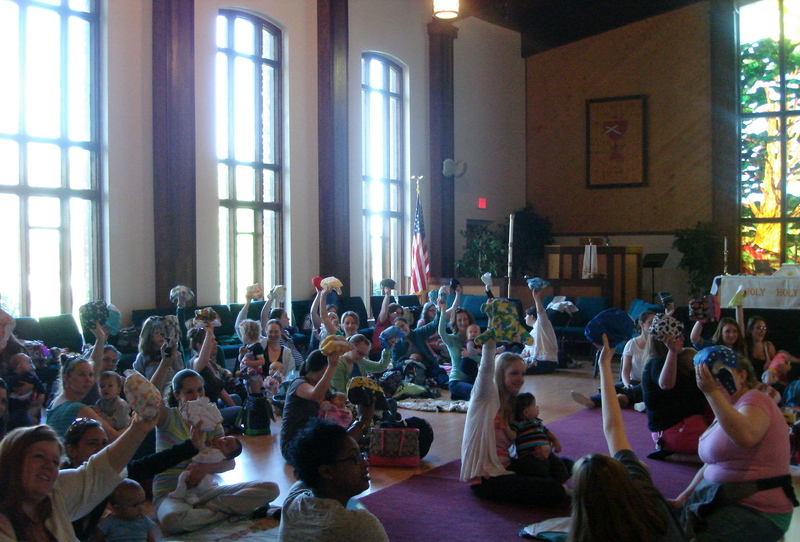 Participants in The Great Cloth Diaper Change hold up the clean cloth diapers they will use when they try to set a new cloth-diapering record. FAIRFAX, May 13, 2013—Officials with The Great Cloth Diaper Change have informed Guinness World Records leaders that they set a new world record during their April 20, 2013 event. Representatives of The Great Cloth Diaper Change recently reported on their website that they have informed record officials that participants changed 8,331 babies into cloth diapers during the international event. Angela Torres, Real Diaper Association board member and one of the hosts of the Fairfax Great Cloth Diaper Change event, said that those present not only broke the record, but also advanced community knowledge about cloth diapering. “[The Great Cloth Diaper Change] also lets families who don’t already know that there is a tremendous amount [of] support in their communities where they might not have thought to look before,” Torres said. Officials with The Great Cloth Diaper Change indicate on their website that the previous record—which they set in 2012—was for 8,251 babies being changed into cloth diapers at the same time. Those leaders also report on their website that participants in The Great Cloth Diaper Change in 2011 set a record that year. They write that the 2011 record was 5,026 diaper changes. This story is an update to the following article. FAIRFAX, April 21, 2013—Parents and babies assembled at Fairfax Christian Church on Main Street recently to help set a new world record for the most cloth diapers changed. They arrived with bags, blankets and bottles and a common goal: to raise awareness about the benefits of cloth diapering. “We bring cloth diapering families together, educate parents and caregivers about cloth diapering and help them make the change using simple, reusable, real cloth diapers,” Angela Torres, one of the hosts of The Great Cloth Diaper Change — Northern Virginia event, said. “We also want the general public to know that cloth diapering is not some underground practice, but something that is normal in a growing number of households,” Torres said. Melissa Poulin, a Centreville mother who brought her young daughter to the event, said cloth diapers are the standard in her house. “I’ve used them since she was three months old. It’s just way better for the environment,” Poulin said. Courtney Belcher, a mother from Quantico, Virginia, said she has been diapering her son in cloth diapers since he was two months old. “I like the whole cloth diaper advocacy,” Belcher said. Lisa Martinez, owner of 2 the Root, a cloth diaper service that serves residents of the District of Columbia, Maryland and Virginia said she had a similar commitment to cloth diapers when her child was younger. “I cloth-diapered my son from birth to potty,” Martinez said. “The kids potty train up to a year faster in cloth diapers,” Martinez said. Hannah Neas, a cloth diaper store owner from Sterling, Virginia, said she and her spouse enjoyed other benefits of cloth diapering. The event was part of a larger, international attempt by parents and caregivers to set a new record for the Guinness Book of World Records. Heather McNamara said that during the one minute that it took for parents participating in the Great Cloth Diaper Change to change their babies’ diapers, parents using disposable diapers would send 876,000 such diapers to landfills. McNamara is executive director of the Real Diaper Association, an organization based in San Diego, California. She said that parents and child care providers send 39,000 tons of disposable diaper waste to landfills each day. “We should have an unofficial number by Friday, with official numbers expected back from Guinness on May 1,” she said. Sara Wilcox, PR & marketing executive for Guinness World Records North America, Inc. said her organization has received a claim for this event. “At this time, we are waiting on documentation to be sent in to our offices for our records team to review and determine if a new record has been set,” Wilcox said. “This is a new record category,” Wilcox said. Fairfax County officials indicate on their website that they anticipate that the population of the county will have grown by more than 19,000 people by 2015 over where it was in 2011. Leaders of The Great Cloth Diaper Change estimate that each baby uses about eight diapers per day. If one estimates that those babies are born at a rate of about 4,000 per year, those babies would generate 32,000 diapers per day for about two years. That amounts to more than 11 million diapers per year and more than 23 million diapers before those babies are potty-trained. Parents and children arrive at Fairfax Christian Church prior to the event. Parents and their children wait for the event to begin. Participants and attendees of The Great Cloth Diaper Change interact with one another prior to the event. I used cloth diapers for all 3 of my babies. Of course that was many years ago, and it was mainly for economic reasons. By the time I had my third child, most of the families I knew were using disposable. It’s been my belief as well that it’s easier to potty train a child if you use cloth diapers.